Christmas season may be months away but here in the Philippines, as soon as it hits September, red, green and gold decors start to pop out everywhere. And you know what that means for HR and marketing professionals – it’s time to think of gift ideas for possible corporate gifts for the upcoming holidays! This is especially true for companies that require hundreds or even thousands of corporate gift baskets or giveaways, considering that production may take quite some time. Whether you’re a small, medium or large business, there are a couple of things to consider when selecting the right corporate giveaways. With the market full of options, it’s not easy to choose the perfect gift to give to your clients, staff, and partners. This is why we’ve made a list of things you should consider before ordering or purchasing corporate gifts. Yes, you want to show appreciation to your clients, but it doesn’t mean that you have to spend a lot of money to do so. It’s a good idea to make a budget and then pick the gift item that fits your budget accordingly. Impressions last. It’s important to remember that the gifts you give out during the holidays is an extension of your appreciation towards your clients. Simply put, it helps in the promotion and branding of your company. It makes a lasting impression for your business. Find a supplier that can deliver high quality gifts without breaking the bank. Think of it this way: if you’re to receive a Christmas gift, what would you want to get? The most successful gifts are those that are not common. Your client would surely appreciate and find extra value with a gift that is truly unique or personalized, whether with their names or their company’s logos. Also, wouldn’t it be amazing to know that the gift you give them is something they would find practical use for on a daily basis? Similar to all aspects of your company branding, the gifts you give out during the holiday season should also bear the identity of your company. From the packaging to the gift card you’d be using, the possibility is endless on how you can incorporate your company’s brand into your gifts this Christmas. Research shows that something as simple as a printed pen or mug can go a long way towards helping establish a strong brand identity – which is created by embedding your business’ values, logo and name into the minds of current and potential customers. As such, simple items like a printed pen, bag or mug which are items seen and used by the recipient on every day basis will help achieve this. Think, everyday items like these marked with your brand’s logo are often most effective as these offer you an enormous amount of exposure, over a long period of time. 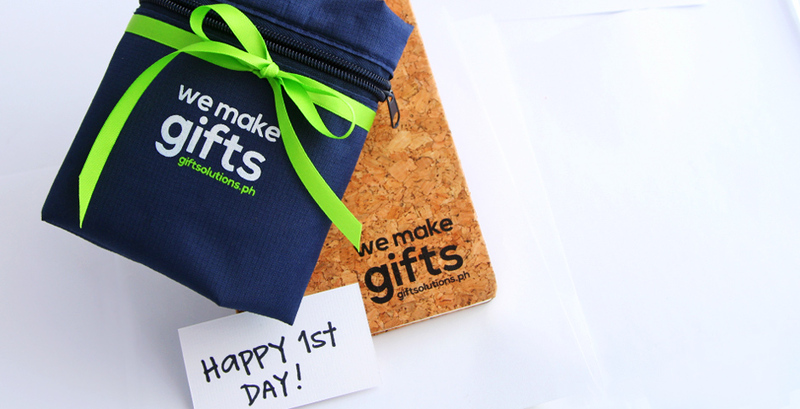 A handwritten note with your corporate gift will do wonders! It adds another layer of thought that your clients would truly appreciate. Let’s face it, the reality is your client would be receiving tons of gifts this holiday season. But with your note, you won’t fall prey to the dreaded “out of sight, out of mind” syndrome. However, do make sure that you spell their names or their company’s name correctly on your note. You wouldn’t want to flop on your attempt on making a great impression. Similar to the point above, it’s also important to give proper attention to your gift’s packaging. It’s because if the packaging of your gift is attractive, your gift will stand out from the pile & then your clients would get more excited to unwrap your present. The gift you give says a lot about your company, and so will its packaging. The perceived value of your gift can be considerably be enhanced with the right packaging. After all, it’s the small things that demonstrate your good taste and attention to detail. As you’ve probably been thinking, giving out corporate gifts is not an exact science. Try to be creative but at the same time, don’t stress over finding the “perfect” gift. Still not sure what to give to your clients this Christmas? Contact us and we’ll be happy to help you out! 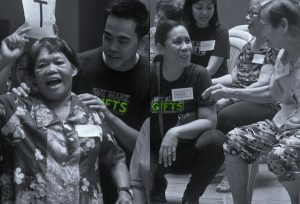 At Gift Solutions, we believe that being grateful is best shown by giving joy to the people who matter. To the people we deal with every day – our families, friends, clients, co-workers, and employees, giving joy may be as simple as a handwritten thank you note or a well-thought-out gift. To the people we oftentimes forget, giving joy might be just as simple as giving time. Since 2016, our company has visited the Little Sisters of the Abandoned Elderly to spread joy to the women residents. Located in San Juan, the home has over 90 residents – all of whom with stories and smiles to share. We have learned from and are enormously grateful for the time we have spent with them. 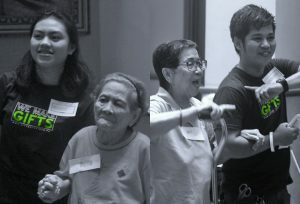 To learn more about Little Sisters of the Abandoned Elderly, please contact 0917-836-0083.